Location: Baltimore in western County Cork, Ireland. Notes: Dunasead Castle (Dun na Sead in Irish, meaning Fort of the Jewels), is a 17th-century fortified house situated in the town of Baltimore in western County Cork, Ireland. The present castle is not the first to have been built on the site. In 1215, an Anglo-Norman settler, FitzStephens, built a tower house with a bawn there, which itself replaced a much older fortification, probably a ringfort. In 1305, the castle was attacked and burned down by one of the most powerful Gaelic septs in the region, the MacCarthys. Another Gaelic sept, the O'Driscolls, much smaller but still powerful in the region, subsequently took possession of Dunasead and rebuilt it. 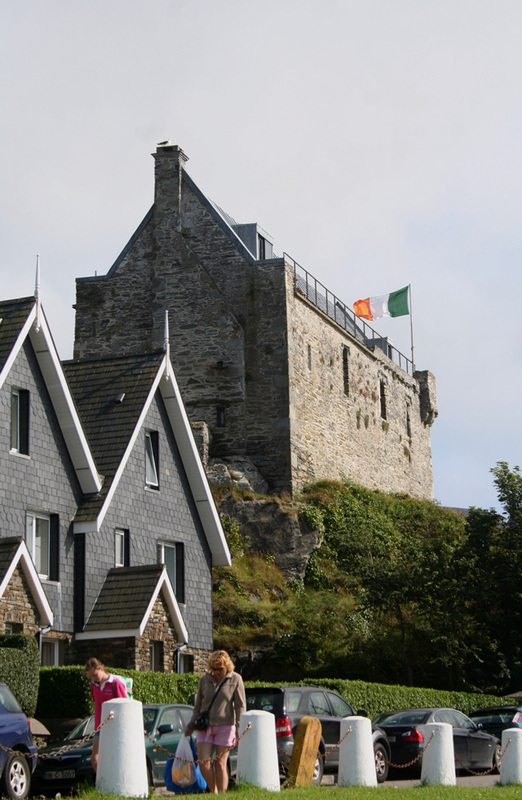 The O'Driscolls were constantly under pressure from encroachments by Anglo-Norman settlers and rival Gaelic clans on their territory and trade interests, which resulted in the castle being attacked and destroyed numerous times in the following centuries. One especially long-running feud erupted between the O'Driscolls and the merchants of Waterford City in 1368, following an attack on the Waterford fleet by the O'Driscolls. This feud continued on and off for almost two centuries, ending in the sacking of Dunasead, Baltimore and other O'Driscoll castles by another Waterford fleet in 1537. The castle was rebuilt, but, following the O'Driscolls' support for Hugh O'Neill at the Battle of Kinsale, the castle was surrendered to the English army. Some of the O'Driscolls received pardons, and Dunasead was returned to Florence O'Driscoll, who subsequently leased it out, along with most of his lands, due to financial problems. The present castle was probably built in the 1620s and was surrendered to Oliver Cromwell's forces in 1645. The castle later fell into ruins, but has recently been renovated and is in use as a private residence.